Well now that most of the show season madness is over and everyone is waiting for their orders lets take a look at Zodiac’s Open 7 RIB. By all viewing angles the observer realizes that Zodiac’s Open 7 is a whole new and modern approach to running the blue water. Generous aft seating means bringing friends and family out for some exploring and adventure was never easier. Transom steps and boarding ladder options envelope the outboard and give bathers a sure and positive way for getting into the Zodiac Open 7 regardless of fitness level. Zodiac’s forward thinking seems apparent just about everywhere you look. Upon inspection you’ll notice deck fittings already strategically placed to add additional seats, scuba racks, etc. making the Zodiac Open 7 truly mission configurable. Integrated anchor roller and bow step up forward removes the uncertainty of anchoring up for lunch on the hook or a simple swim call. The chain locker is generous and offers easy access via a marine latch and forward hatch. Refueling can be a pain at the fuel dock so Zodiac made it easy on the Open 7, with access to the secondary hatch right where it ought to be. Speaking of hatches the Zodiac Open 7 has a lockable gas strut assisted console hatch that leads to a truly cavernous under deck stowage locker. 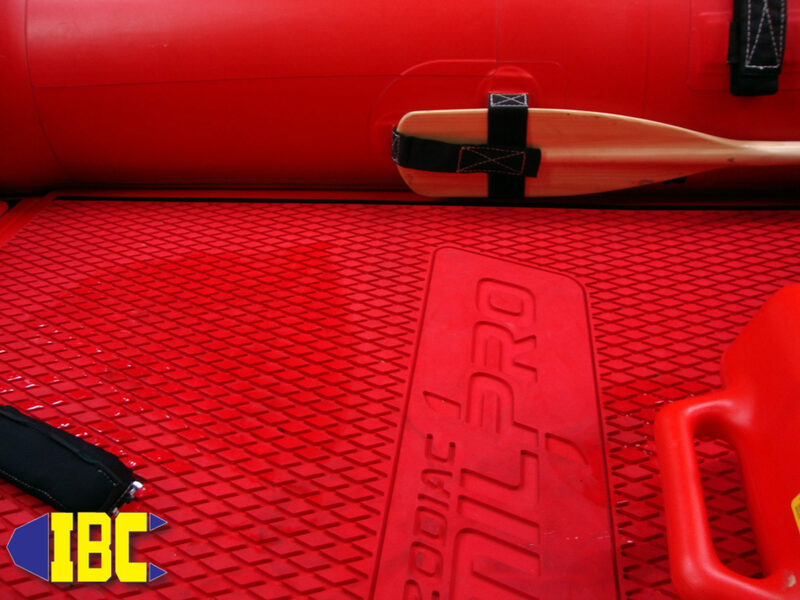 No more worrying about gear left aboard, pfd storage or water sports storage. One just puts everything below safe and secure. If water sports are your thing then Zodiac has heard your call and made a sleek and functional towing arch option that looks as good as it works. If you’re towing the kids on a tube or you’re trying to set the wakeboard endurance record the Zodiac Open 7 answers your call in a stable, safe, fun, and efficient craft. With the ever changing field of marine electronics breaking new tech every six months it’s hard to plan for dash space to layout all the doodads. Zodiac is above all a tech company and as such redesigned the console and dash on the Open 7 to accommodate the future of boating electronics. This was a forward thinking move and one that the mechanics and riggers are cheering about. The would be boater can have everything they ever dreamed of and more! When considering a hull’s efficiency to cut thru the bumps and chop many manufacturers take the easy way out and design for one scenario thereby limiting what the boat will do in any given sea state. Zodiac has taken their enormous knowledge base into the design phase and put together a truly open water hull. Performance is optimized to the very edge of hydrodynamic law making the Zodiac Open 7 suitable for blue water, fresh water, lakes or rivers alike. Zodiac takes it’s lessons learned from hard military applications, shipping, rescue and exploration to a whole new level for the recreational customer. Many state and federal organizations will love the what this hull design will do for their missions let alone the recreational customer out for a quick fun trip. In the terms of power and economy IBC’s choice to rig their premier Zodiac Open 7 with a clean burning and quiet Yamaha F250HP outboard is a perfect balance of power and grace. The Yamaha F250 coupled to Zodiac’s Open 7 purrs like a kitten sipping fuel like the aforementioned kitten lapping milk from a saucer. Pushing the throttle forward transforms the kitten into a team of roaring lions on a yolk. Taming that lion team is easy with the Zodiac Open 7’s hydraulic steering control and offers nimble maneuvers at any speed. You won’t even notice how fast you are moving until you see your speed on the generous digital screen. The Zodiac Open 7 literally tears your expectations asunder and gives you the smoothest ride possible afloat. We just couldn’t find anything wrong with the Zodiac Open 7, it all seems so right. At a price of $70K with trailer from IBC in Portland Oregon it makes you wonder why anyone would need another kind of boat when the Zodiac Open 7 does it all, and does it better. 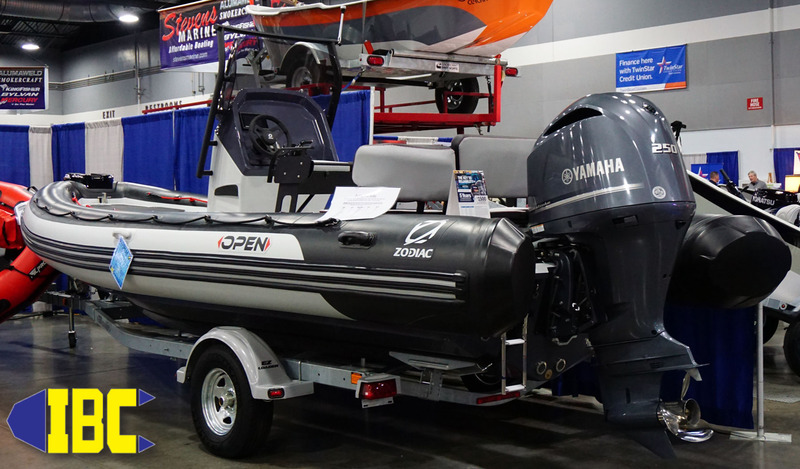 To view the Zodiac Open 7 contact the team at The Inflatable Boat Center (IBC) by phone (503)235-2628 and schedule an appointment. If you’re on the other side of the world have a look below at IBC’s Portland Boat Show Open 7 premier in North America. Previous PostPrevious Fishing From An Inflatable Boat? Say What! Next PostNext How Much Air Do I Put In My Zodiac?